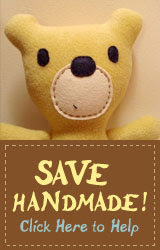 To Love a Rose: Save Handmade! One of my favorite blogs that I literally check every day is called Cool Mom Picks. It's amazing what they post on this site; I'm always in awe of their abilities to be so effortlessly, well, cool! Recently, I read their post about Congress passing the Consumer Product Safety Improvement Act; which could ban the selling of our favorite homemade goodies from places like Etsy and Ebay. Where would we be without those sites?! A pretty sad place, my friends! I'm not going to even try to write about it myself when the cool kids at CMP have already done such a great job; so, I'll just give you the link, and you can check it out yourself. Spread the word! We need to stop this act from ruining my ability to shop at my favorite online stores - haha!